Day Three: I don't know where to start. I don't have the strength for any more tears tonight. You're three days old now and I've held you twice. My breasts are filling but you might never be strong enough to nurse. Kelly, we have loved you since the minute we found out about you -- even before. Daddy and I have spent many hours, talking and singing to you through the holes in your incubator. The doctors think we should take you off the respirator, but we don't believe that's right, so we're not going to. Today, they are starting to feed you my milk through a tube. Yesterday, I got to hold you sleeping against my breast. We feel so uplifted by prayer that I was almost worried we would come to the end of it, but I realize that God is not going to give us “almost but not quite” enough. He’s asked us to be faithful today, and He will give us the grace and strength to get through today. Day Seven: Today, you are one week old. Statistics say that you only had a fifty percent chance of living a week, and you made it, but we know it’s not chance. No matter how long we have to hold you, you will always be part of our family . . .
Let me tell you your story. This is a story of God’s hand. Last Thursday, we decided, last minute, that I would come to the Lower Mainland, to surprise my family. Then, on Monday, we came to Vancouver for a field trip, to the Aquarium. My water broke while we were having lunch and ran down the sidewalk. One of the Dad’s was a doctor and he told us to come straight to Children’s Hospital. The surgeon said that you wouldn’t have made it if we’d been anywhere else. I could not feel you moving, but you had a heartbeat, and I cried when I heard it. They measured my tummy and were concerned that it was so small, now that my water was broken (about 24 weeks). You were turned sideways, so the doctor turned you around. Then they did an ultrasound and saw that the placenta was covering my cervix. I began to bleed a lot, so they had to do an emergency C-section. It was done in record time. Mommy got very sick because of an error that was made during delivery. Daddy couldn’t be there because he was on his way on a plane. Grandad called Daddy at work, and he drove right to the airport and got here about an hour after. I was so worried about you after they took you out because I couldn’t hear you cry. I kept saying, “tell me about the baby, and I’ll be OK.” Before they took you away, they held up the little thin, white arm for me to see. It was so scary but I was so sick, I could hardly comprehend. Daddy and I had talked about what to call you before you were born, so as soon as you were born, I started thinking about my little Kelly. You kept me fighting. That night, they brought me in on a stretcher to see you. You were so tiny and covered with wires, and I couldn’t even sit up to see you. The next morning, you had a blood transfusion and I got to see you again from a wheelchair. You were so tiny. That night, I moved up to one of the maternity wards. It was really hard to sleep because of the other babies crying, and I didn’t have you. Back on Day 3, a doctor came to see us and told us that you are very sick. 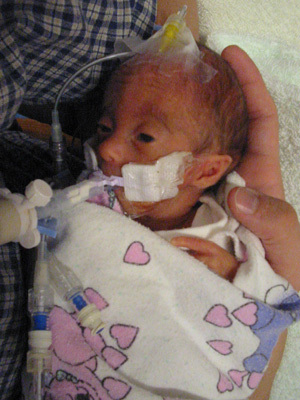 You have holes in your heart and a chromosome disorder, called Trisomy 18, and you may only live a few days. The news was such a shock, yet at the same time, God had been preparing both of us. Day Thirteen: You’re gaining weight and breathing just a little on your own. I’m thinking about planning a birthday party for you, if you make it to your due date. Day Seventeen: You were worse today. You are pale and have a big tummy. You had an X-ray on your stomach but I don’t know anything about it . . .
Dear God, this precious girl is a gift you have given us for a time. We have committed her to Your hands and care. Yet, every turn for the worse makes me want to hold on that much tighter. Help us to be faithful today, Lord. Yesterday, you were doing so good. You were gaining weight (back to your birthweight). The respirator has been turned down 5 breaths per minute each day, to try to help you breathe on your own more. We’ve been feeling more hopeful. We know we don’t get to keep you forever. The same is true for Hailey, really, but we already have had you longer than we expected. The first week was the hardest. We didn’t know if we should rejoice – or grieve – or hope – or fight. One afternoon, I thought I would be completely overwhelmed, but God is faithful and will not abandon us or give us more than we can handle, with Him at our sides. We never thought we really wanted or would be good at caring for a child with special needs, but God counted us worthy of the gift of you. We love you dearly. Now, as I sit here with my hand gently on your chest as you sleep, I pray to God with my heart, both thanking Him for each precious minute, asking and believing Him to let us keep you, and asking Him to take you gently to His arms. Day Nineteen: Well, today was the big meeting we’ve been waiting for. All the doctors met to discuss the possibilities for our dear little girl. They explained that she’s far too tiny to operate on her heart. They told us there was nothing they could do. They recommend we bring her home to die. It feels like torture, being left with the responsibility of this choice. I have to remember that Kelly will live or die, no matter what the doctors do or don’t do. We don’t want to be guilty of making a decision that is not ours to make . . . . each of her days were numbered in His book before one of them came to be. We sang worship songs together tonight. It’s hard to sleep because my heart aches. Day Twenty-Three: Bernard and I decided last night that, since God has worked everything out perfectly without us up until now, He could do this without us, too. We’ve been in such turmoil all weekend and when we decided not to do anything, we had such peace. I talked to a new doctor and she told me that if they had known before she was born that Kelly had a “life-limiting” condition, they never would have intibated her (put her on the respirator) – another praise to God for His control over every detail. Yesterday, you had a 95% leak in your breathing tube, so they took it out and put you on “bubble CPAP,” (breathing on her own with high-flow oxygen) which is far better for you. She’s been doing it for one and a half hours. God, please help her to keep breathing. I know you can change your mind and Lord, there are thousands of people praying for our little girl. Please hear our prayers. I sit here by your bed, wildly hoping and praying you can keep it up, and they won’t have to put the respirator back in. Could this be the beginning of the road home? Day Twenty-Four: Dear God, I don’t understand. Yesterday, I was so hopeful, and then, she had to go back on the respirator. She breathed on her own for five hours. Do I lack faith? Please help me to believe. Believe what? That you can make her breathe on her own? That you can fix her heart? Her brain. Her Trisomy 18. If you are ever to want to change your mind about something, we’d sure love to keep her, no matter what is wrong with her. We would do our best to take care of her. You are Lord, our Provider, Lord, our Healer, All Sufficient One, God Creator, God our Father. God is who He says He is. God can do what He says He can do (heal, comfort, provide strength, revive the weary, never leave me). I am who He says I am: beautiful, precious, loved, strong. I can do all things through Christ. Even this. God’s word is alive and active in me. June 30 – One Month: You were worse last night. Another blood transfusion, antibiotics and new med’s to help your heart pump. I can’t hold you today, so I sit – and watch – and think – and pray. I find myself talking to other children with disabilities, hoping that some day, people will be kind to Kelly, too.